Are Republicans More Divided on Foreign Policy? Today’s Republicans are as divided on foreign policy as they’ve ever been, and Mr. Romney is finding it hard to bridge the divisions. No wonder he zoomed past foreign policy in some 3 minutes of a 39-minute speech. Is it true that Republicans are unusually divided on foreign policy? There are several ways to look at this question. 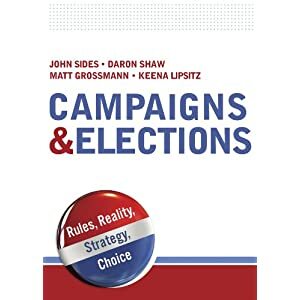 Katulis focuses on the divisive influence of neo-conservatives and new isolationists that are crowding out the pragmatic realist center of the party. Yet, Condoleezza Rice sounded more like a pragmatic realist internationalist than a neocon last week. It is also not clear that these divisions are so novel. Perhaps their exposure is a feature of being in opposition. In the late 1990s, the Republicans were extremely divided on important issues of war (e.g. Kosovo), trade (e.g. China’s admission into the WTO), and diplomacy (e.g. the comprehensive test ban treaty). Another angle is to look at public opinion. Below are some graphs based on data from a recent YouGov poll. Let’s start with trade, which historically tends to become a controversial and partisan issue in hard times. 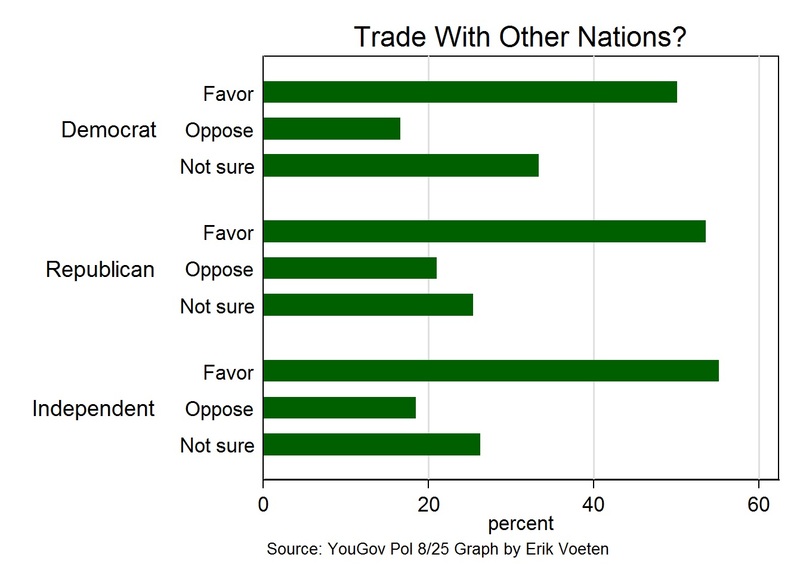 Yet, the graph below shows that both Democrats and Republicans are equally divided over trade policy. Indeed, trade policy is one of the few important issues (from a policy perspective) that are both divisive and where partisanship explains virtually none of the variation. While the Republicans are not more divided on trade policy than the Democrats, it is true that historically they were more unified in support of free trade. Thus, it may be that the Tea Party and co have made the issue less attractive for the Republicans. The next graph looks at defense spending. 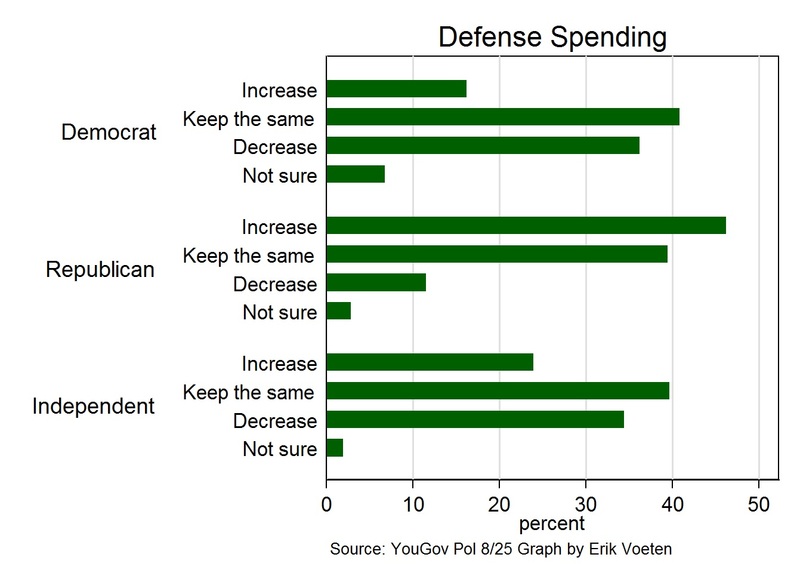 Here we do see the usual historical patterns: Republicans by and large want to keep defense spending the same or increase it while Democrats are more likely to favor decreases. But the Republicans are not more divided on this issue than the Democrats. If anything, the opposite is true. What is noticeable, however, is that Independents look more like Democrats than Republicans. This makes this hardly a winner issue. Some other foreign policy issues yield similar conclusions. Republicans and Democrats have pretty similar views on Afghanistan and where they do not (on the decision to send troops in the first place) Independents are closer to the Democrats than the Republicans. The rise of Tea Party isolationists and the perceived failure of neoconservative foreign policies haven’t made the Republican Party more divisive internally on foreign policy issue than the Democrats. But they may have led to an erosion in the advantage Republicans were long perceived to have on foreign policy issues. This doesn’t make foreign policy issues easy for the Democrats. There is plenty of diversity within that party on trade, the military, and the war on terror. But the fact that those divisions cannot be so easily exploited should help Obama. One Response to Are Republicans More Divided on Foreign Policy? It seemed weird to me at the time just how much influence the neo-cons achieved in the early 2000’s. I agree that those philosophies aren’t sustainable and that the non-interventionist strain will reassert itself. At the same time, I think they’re steering clear of the issue because of the Democrats’ performance over the past four years. They would be hammering at it if Obama had made clear mistakes or if there was a Carter-type situation, but it’s not really a strength for them this election vis-a-vis the Democrats.